My twelfth ground of 2015 was on Tuesday 4th August at Woodside Park in Bishop's Stortford, Hertfordshire. 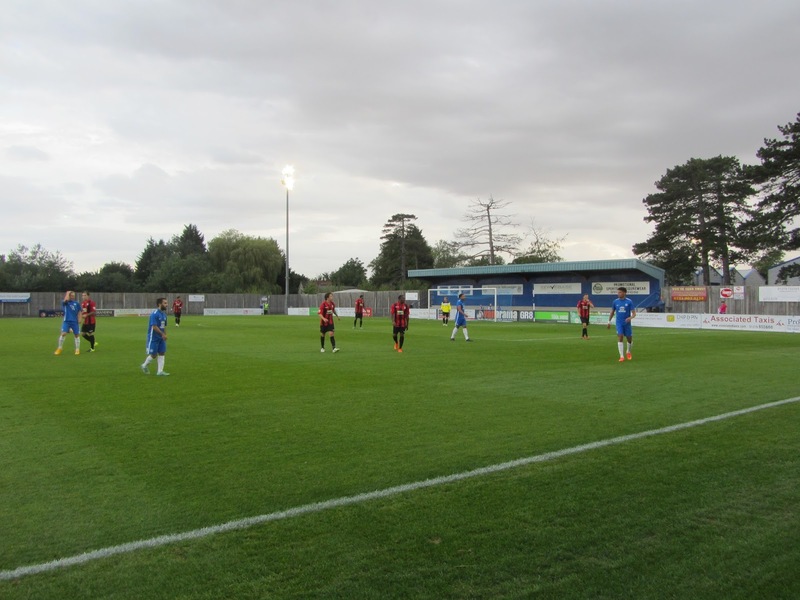 The match was Bishop's Stortford vs. Peterborough United in a friendly. Woodside Park sits in a business park just off the junction linking the M11 to the A120. The ground is 1 mile from the outer edge of Stansted Airport and 1.5 miles from the nearest railway station at Bishop's Stortford. The club played at Rhodes Avenue between 1919 and 1997 and after a couple of seasons groundsharing moved to their current home in 1999. 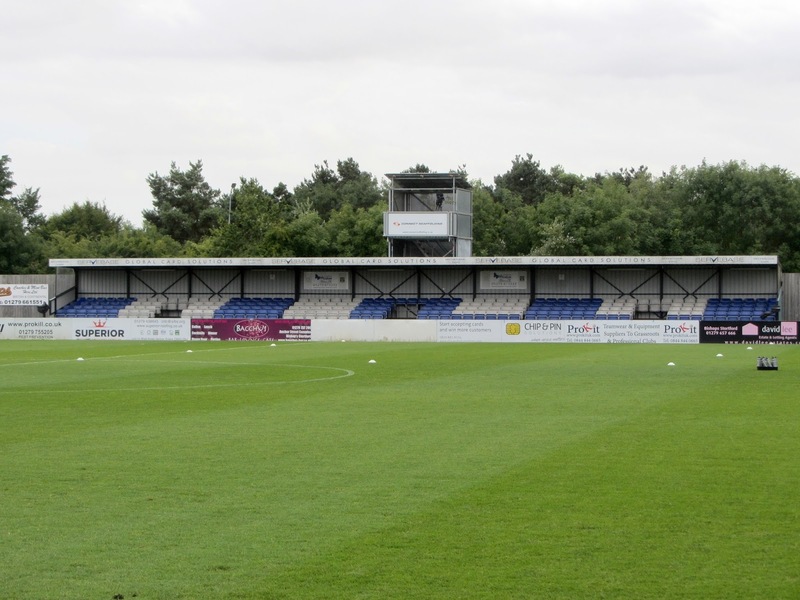 The Main Stand is on the northern side of the ground and has room for 300 spectators. This stand contains the club bar and dressing rooms and there is an additional building behind this which houses a function/entertainment suite. In front of the Main Stand are the two dugouts and general uncovered standing. The South Stand has been added since the opening of the stadium - this 225 seat structure has a TV gantry on top. The rest of this side of Woodside Park is a few steps of uncovered concrete terracing which extends round to the goals. This terracing then increases behind the two goals to form additional covered stands. Finally there is a very small covered seating in the north-east corner with half a dozen seats for disabled fans. 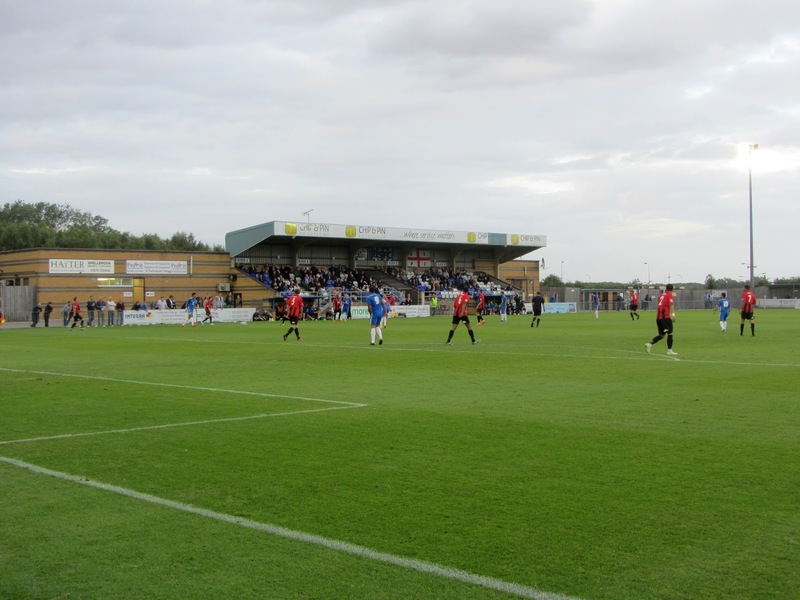 The game was a friendly between National League South side Bishop's Stortford and Football League One side Peterborough United. The home side flew out of the gates and took the lead after barely a minute - a corner was lofted to the far side of the box and found Anthony Furlonge in acres of space. Furlonge headed it back over everyone in the area and into the net. Stortford almost doubled their lead just after this after a one-on-one chance with the keeper but Dion Henry in the Peterborough goalie was up to the challenge. The hosts did get the ball in the net though in the 20th minute - Frankie Merrifield picked up the ball 25 yards out and with nothing much on unleashed a superb curler into top corner. The visitors appeared to have got over their lethargic start in the 25th minute and almost scored when a wayward clearance by a home defender came back off his own crossbar. 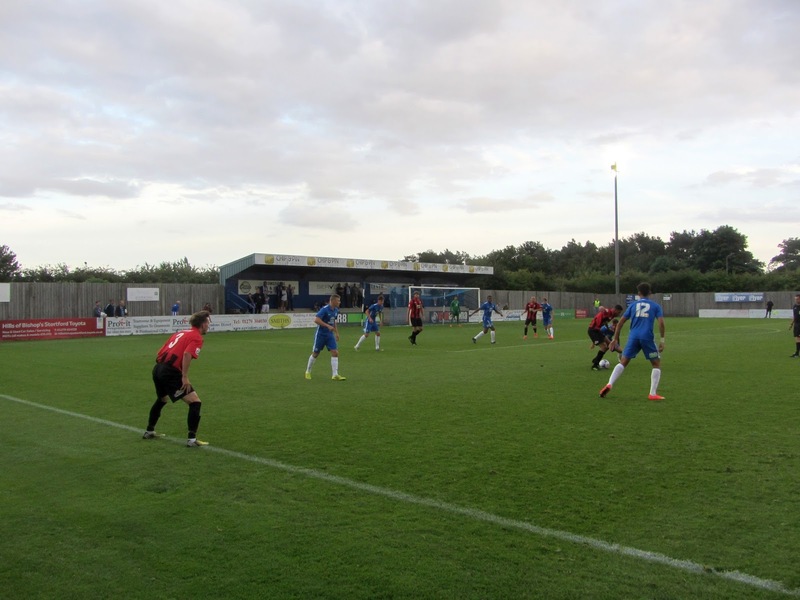 However the young Peterborough side switched off again on the half-hour mark allowing Stortford to score again - a free-kick was sent into the box and a static defence allowed Anthony Furlong to nod in simple header. Coming out for the second half 3-0 down Peterborough clearly wanted to improve the scoreline and in the 50th minute a long ball found Kyle Vassell who controlled well before slamming it past keeper. Any hopes of a comeback were dashed though in the 58th minute as the three goal margin was restored when Mikel Suarez bundled in from close range after an initial save by the Peterborough keeper. There was time for one more goal in the 71st minute with this one going to the away side - a low cross was sent into the box and missed a number of players before Souleymane Coulibaly slotted in at the back post from a couple of yards out to bring the score to 4-2.